This bedspread looks great in my daughter's room! Colors are vibrant without being obnoxious. Bedspread/shams seem to be well made. Fabric is a nice weight. Love the variety of patterns in the bedspread! Inspired by the native vegetation in California, the Native Springs quilt features a fun mix of botanical motifs mixed with geometric patterns. Bring a fresh, chic and playful look to your bedroom. Beautifully combined selection of pattern fabrics in cool greens and blues. It looks great in my guest bedroom. It's 100% cotton and a good weight. 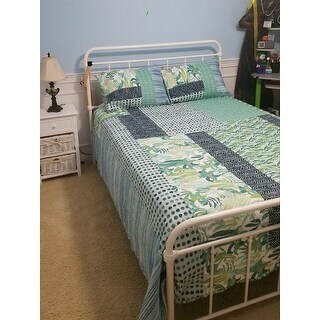 Purchased this set for my daughter's full size bed. It is very well made, love the color and the size is very generous. My daughter loves the colors as well. Beautiful colors true to pictures. Soft, comfortable fabric perfect for our vacation home! Haven't washed yet but fabric and stitching are nice quality. The colors of the sea enhanced by lovely flowers. Attractive leaf pattern on reverse side for ease of flipping for a varied look. Great find! Bought two for a room with 2 twin beds.